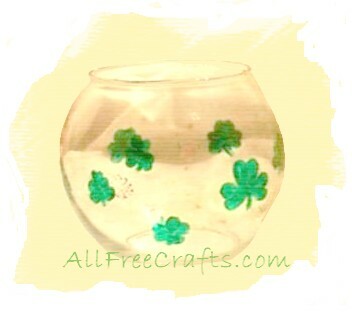 If you’ve never painted on glass before, this St. Patrick’s day shamrock ivy bowl is a perfect project to learn a new skill. 1. Wash the ivy bowl thoroughly with soap and water and allow to dry completely. 2. Paint on the design. Shamrocks are easy to do – simply paint three heart shapes to make the familiar shamrock leaf shape, with a small stem added at the bottom. 3. If you make a mistake, you can erase the paint with rubbing alcohol, then allow it to dry and begin again. 4. Wait 24 hours to allow paint to set and cure, before baking to set the design permanently. Follow package instructions for baking — the glasses shown were baked in the oven for 40 minutes at 325 degrees. After baking, your design should be resistant to normal usage and dishwashing.